Compressible Flow Module | 3DynaFS-COMP | Dynaflow, Inc.
3DynaFS-Comp&COPY; - The 3DynaFS&COPY; compressible flow module solves the Euler equations using a 2nd order Godunov-type method to capture accurately the location of discontinuities such as shock waves and contact surfaces. The code uses a Level Set method and a mixed cell algorithm to simulate multi-phase and multi-material flows. A general Equation of State is used for describing various fluids and fluid like solids. 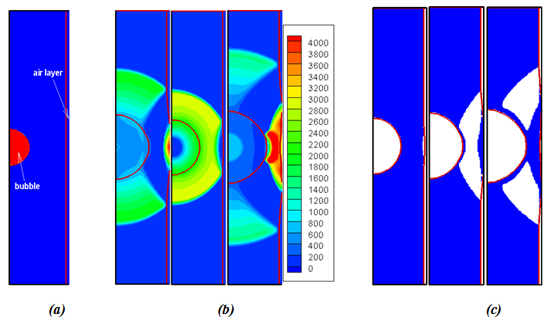 This module is also capable of simulating pressure wave propagation through bubbly media including shock waves, large liquid/gas interface deformations and cavitation induced by expansion waves. 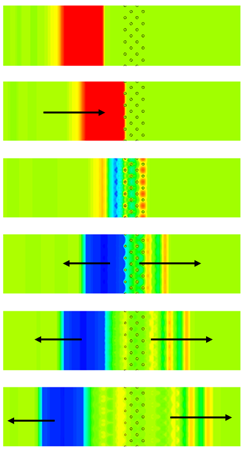 Shock and air-layer interaction captured by 3DynaFS-Comp&COPY; using Level Set scheme: (a) initial condition; (b) pressure contours at three instantaneous times; (c) cavitation region visualization at three instantaneous times. 3DynaFS-Comp&COPY; can be coupled with the Lagrangian bubble tracking module, 3DynaFS-Dsm&COPY; to simulate shock wave propagation and interaction with two-phase bubbly media. Animation of instantaneous pressure contours due to the interaction of a shock wave and a bubble layer.